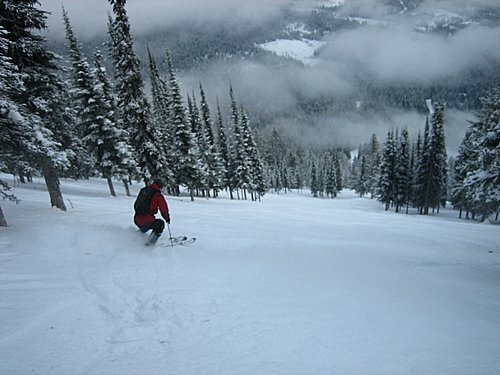 There’s no getting around the sad reality that Red is the last ski resort in Western Canada to open. The coverage and especially the snow quality has been deteriorating these past couple of snowless weeks, but it’s been decided that the lifts will start running this coming Saturday Dec 17th. I was told today that the Silverlode, Motherlode and Paradise chairs will be operating, but that skiing on Granite will be limited to Southern Comfort, Southern Belle and Rino’s. That many of us have been enjoying skiing the whole mountain for the past month, and that coverage is still adequate to good in most areas matters little, as patrol and management want it known that closures will be enforced. Protecting the clueless from their own folly apparently requires that we all suffer. A little new snow overnight has marginally improved the otherwise firm snow surface, and we had fun on First Slide this morning, but it won’t be an opening to remember. I’ll be cat-skiing instead. How absurd! Most runs have a fine coverage and they will be closed? Maybe they want to lower skier numbers at Red. Great comments Stew. Keepin’ it real as always! It never ceases to amaze me how little off season trail maintenance they do here as you can witness by taking a ride on Paradise. Too busy wasting money doing a half assed job renovating the base lodge for no apparent reason. I have skied more days at 49 North than I have here. Glad I bought and early bird pass down there for around $250. Way to go “Exasperation Mtn”.